Weekly--if not more often--a new broadside appears and makes the rounds of generally right-wing blogs and talk shows. The latest talking point is that Germany is burning more coal than ever because of all the intermittent renewables that have been added to the system. So, let's have some fun with numbers and separate fact from fiction. First, the source. All the data I'll use comes from the Work Group on the German Energy Balance (Arbeitsgemeinschaft Energiebilanzen) and can be downloaded from their web site. There are others sources of this data. This happens to be one that I could find easily, the data was relatively concise, and it was in spreadsheet form. Ideally, I would put all the information on one chart, but this much to busy to easily read and comprehend. Consequently, I've broken the data down into a series of charts. Total renewable generation was less than brown coal in 2011. However, at last year's pace of growth, renewable generation may exceed that from brown coal by 2015. Total German electricity generation increased from 550 TWh in 1990 to 615 TWh in 2011. Generation peaked just before the financial collapse in 2007 at 637 TWh. In sum, Germany generated 65 TWh more electricity in 2011 than in 1990, an increase of nearly 12%. That's not a positive, just a fact. Germany will have to do better at cutting consumption for the energy revolution to be successful. Fortunately, German politicians realize this. Whether they take the actions necessary to reduce consumption is part of the current debate in Germany. I am using the term "generation" of electricity here rather than "consumption" of electricity, because Germany, like France and other European countries, both imports and exports electricity to meet the demand of its consumers. In the case of Germany, generation exceeds consumption. Yes, that's right. Despite the claims, Germany exports electricity to neighboring countries--including France. Thus "consumption" is less than "generation" in Germany for 2011 and for many other years as well. Net exports declined in 2011 but they still remained a positive 6 TWh or 1% of generation. Net exports have remained positive during the first six months of 2012 as well. Brown coal-fired generation has decreased about 10% during the past two decades, falling from 170 TWh in 1990 to 150 TWh in 2011. Hard coal generation has fallen even more, slightly less than 20%, from 140 TWh to 115 TWh last year. Overall, total coal-fired generation has fallen 14% from 310 TWh to 270 TWh. 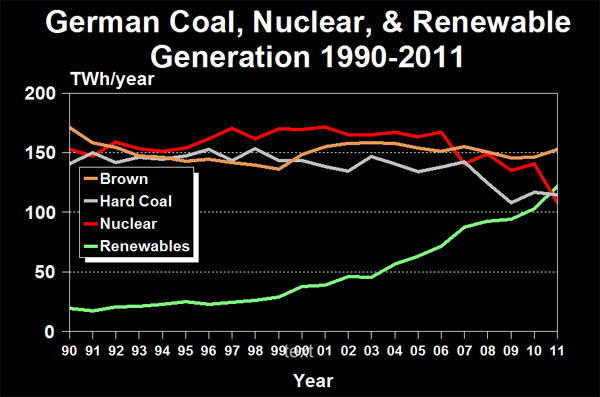 Coal-fired generation made up 43.5% of generation in 2011, down from 56.7% in 1990. Results for the first half of 2012 indicate that coal-fired generation may have increased slightly (~8%) above last year's generation, according to the Fraunhofer Institute. If confirmed for the full year, this would return coal-fired generation to the level just prior to the worldwide financial collapse in 2007. However, this data is only for the first six months of the year and may not be indicative for the full year. Europe suffered through one of the coldest February's on record this year and this may have cause a temporary bump in coal-fired generation. See Renewables Helped France Avoid Freezing in the Dark. Moreover, the source for this data is not the same source as I've used. Those who work with statistics on electricity generation and consumption know that it's no simple matter working with data from different sources. We probably won't know until late next year how much coal-fired generation was actually produced in Germany this year. It has now been more than a year since Germany announced (again) that it was phasing out nuclear power (30 May 2011) and immediately closed eight reactors permanently. However, it is not widely known that German nuclear generation was already in decline. At the time of the conservative government's announcement in 2011, two reactors had already been off line for several years. Nuclear generation increased from 150 TWh in 1990 to a peak of 170 TWh in 2001. Generation began to fall off steeply in 2006 and dramatically declined after 2008. Since 1990, nuclear generation has fallen nearly 30% to 110 TWh by the end of 2011 . Total renewable generation during the past two decades has risen dramatically--in real terms. Of course that is the message that the steady drumbeat of anti-renewables stories are trying to drown out. Total renewable generation increased from 20 TWh in 1990 to 120 TWh in 2011 with most of that growth taking place since the introduction of Germany's Renewable Energy Sources Act (Erneuerbare-Energien-Gesetz, or the EEG) in 2000. Total renewables generation now exceeds nuclear generation, 110 TWh, generation with hard coal, 115 TWh, and gas-fired generation, 84 TWh. Existing hydro accounted for nearly 4% of supply in 1990 and by the end of 2011 total renewable generation had increased five times to nearly 20% of generation. Most of the growth in renewable generation came from wind energy and biomass, but solar photovoltaics (solar PV) contributed nearly 20 TWh in 2011 or about 16% of total renewable generation. Solar already rivals existing hydro in Germany and solar PV's contribution is increasing dramatically. In 2011 it supplied 3% of total generation in Germany and is expected to reach 4% or more of total generation in 2012. Only brown coal generates more electricity in Germany, 150 TWh, than renewables.